Surface Mount Ultra-ADA Pad Detectable Warnings are designed for the visually impaired to feel the raised, truncated domes with their feet. This, in combination with the tapping cane, can alert them to a different surface than the surrounding concrete sidewalk and an upcoming intersection. 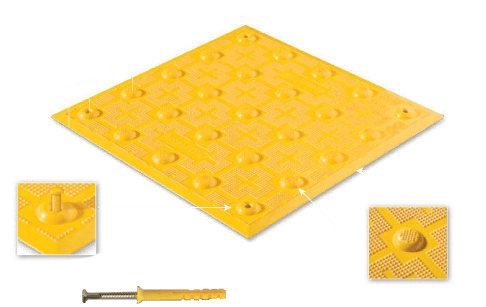 Surface Mount Ultra-ADA Pad Detectable Warnings are designed for the visually impaired to feel the raised, truncated domes with their feet.Easy to install, easy to replace. Our documents page has user manuals and other documentation that can help you better understand your new equipment.